By Train Tokyo Toyoko Line, Gakugeidaigaku station. Exit the station and turn left on the shopping street. Keep straight and continue on Komazawa dori. About 100 meters after crossing Kanana dori turn left on the sakura tree alley. The salon is at the B1 of the third house on the right. By Bus Take Tokyu Bus from Ebisu towards Yoga. Get off at Himonia Nonikawa. About 1 minute walk to the salon. By Car at the crossing between Komazawa and Kanana take Komazawa dori towards Komazawa park. Take a left on the first one way street after the traffic light in front of Quatre cake shop. This will lead to the parking flagged on the map. 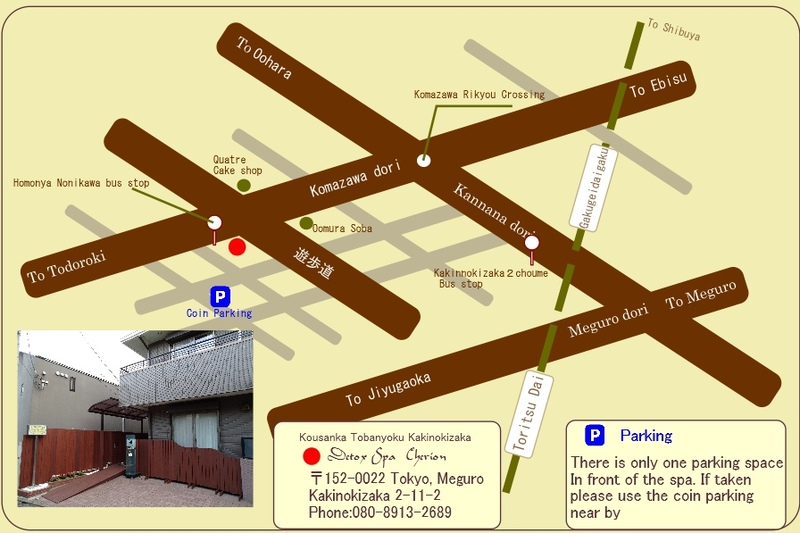 If the Spa space is available, turn left in front of the parking all the way to the sakura alley then turn left again. The spa sign should be visible.